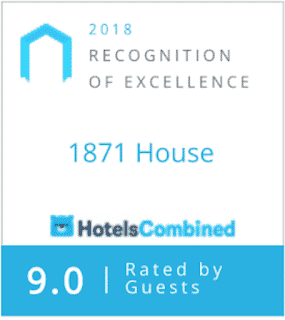 1871 House Awarded the HotelsCombined Recognition of Excellence for 2018! We’re thrilled to announce that 1871 House has just been awarded the Hotels Combined Recognition of Excellence for 2018 in the United States! The award is in recognition for consistently achieving the highest standards of Customer Satisfaction worldwide. The team of data experts at Hotels combined undertook months of analysis of customer opinions online across millions of pints of data having gathered a complete and comprehensive understanding of over one million hotels worldwide. The resulting analyses of hundreds of opinions that our guests have posted on a variety of different websites, forums and social media resulted in an incredible score of 9 out of a possible 10! 1871 House is now representing the top 3% of accommodations worldwide for Customer Satisfaction! We wish to thank all our wonderful guests for their kind input and who have supported us throughout our 20+ years in business! This entry was posted in Uncategorized and tagged HotelsCombined, RecognitionofExcellence2018, TopUSAHotels, WeAreExcellent by admin. Bookmark the permalink.